A Colombian Univision anchor has chilling encounter with a Ku Klux Klan leader named Chris Barker during an interview at the imperial wizard’s North Carolina home. 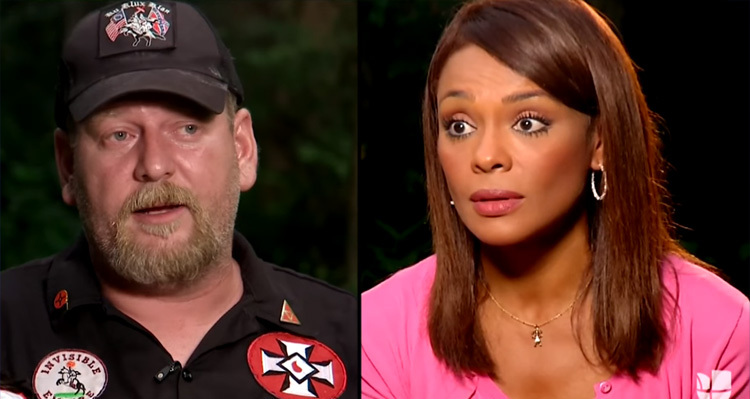 Chris Barker, the “imperial wizard” of the Loyal White Knights of the KKK in Pelham, North Carolina, stirred up controversy during an interview last Sunday with Univision’s late night news anchor, Ilia Calderon, for the show Aquí y Ahora. He was told the interview would be conducted by a Hispanic “woman of color.” But when Barker saw Calderón step out of a car and onto his property near Yanceyville, N.C., the KKK leader appeared taken aback, according to Calderón and her producer, María Martínez-Guzmán. He had expected someone like the rest of the predominately Hispanic, lighter-skinned news crew, they said. Calderón told The Post she had volunteered to do the interview, in order to show her Latino viewers that “these groups are alive.” She had been nervous to meet Barker, but she had never expected to feel as insulted and threatened as she did during the encounter.“I represent the things that they hate: I am black, I am Hispanic, I am an immigrant,” she said. Her own family reflects a merging of cultures. The Colombian native moved to the U.S. 16 years ago, and has since married a Korean American physical therapist. Their young daughter, Anna, is multiracial. The interview quickly got hostile with Barker asking Calderon why she doesn’t “go back” to Colombia. “Why don’t you go back. If you love your country so much why are you here chasing dollars?” he asked. “I go back all the time,” Calderon responded. “Are you going to chase me out of here?” Calderon answered. “No, we’re going to burn you out,” Barker replied. “Are you telling me you’re going to burn me?” a stunned Calderon asked. “Physically, we are. You’re sitting on my property now,” Barker confirmed. “To me you’re a n*gger. That’s it,” Barker told her.